You’ve book your first cruise, how exciting, now to master the lingo so you sound like a veteran. Here are a list of cruising terms you may find useful as you plan and embark on your upcoming cruise holiday. Cruising terms that you will find useful as you begin to plan or embark on your cruise vacation! Cabin – your room, similar to that of a hotel room, for the length of your cruise. Category – the price level of a cabin that is usually based on location, size, and amenities. Double – a cabin that will sleep two passengers. Family Friendly Accommodations – cabins or staterooms specially designed to comfortably sleep up to 2 adults and 3 children. Inside/Interior – a cabin that doesn't have a porthole or a window. Oceanview/Outside – a cabin with a porthole or a window. Porthole – a round window on a ship; now sometimes just referred to as a window for ocean views. Stateroom – same as a cabin. Suite – a cabin that is usually larger than inside, oceanview and veranda cabins; can come with or without balconies and usually includes additional amenities. Triple – a cabin that sleeps 3 passengers. Upgrade – when you are moved from a lower category to a higher one. Veranda or Balcony – when your cabin has a balcony that you can either stand or sit on. Dinner Seating – some lines offer set times for meals; this is known as Traditional Seating. There are two seatings (or sometimes four, with staggered start times) for each meal, with some flexibility offered for breakfast and lunch. Open Seating – no times are established for dining, there is typically a window provided for each meal. This option is provided on some lines as a standard practice; some lines for breakfast and lunch on “at sea” days; and in the evenings at a buffet style alternative to the traditional restaurant; and on some smaller lines all the time. Alternative Dining – may refer to an alternative more casual evening dining option than the tradition main restaurant, typically a buffet on the Lido Deck. Alternative Restaurant – typically a smaller, more intimate onboard restaurant where passengers may choose to dine for a nominal fee; reservations are usually required. Galley - the "kitchen" area where the food is stored and prepared. Room service – yes, most cruise ships offer in-room dining – often 24 hours a day. Captain/Master – the person that is in charge of the entire ship. Hotel Director – the person in charge of all onboard services (housekeeping, food & beverage, etc.) related to your stay. Purser – the officer onboard who serves as a financial or administrative manager. Maitre d' Hotel – the person in charge of the dining room/restaurant wait staff. Cruise Director – the person who heads up the entertainment staff and is usually the emcee for all of the activities and shows onboard. Cabin Steward/ess – the person who mysteriously cleans your cabin when you are not there. Aft – the back of the ship. Beam - the width of the ship measured at its widest point, typically right at the middle section of the ship. Bow – the front of the ship. Bridge – the place where the Captain and his crew manage the ship's journey. Draft - the depth of water required so that the ship doesn't touch the ocean floor. The draft is measured from the waterline to the lowest part of the ship, usually the keel. Fleet – all of the ships within the same company. Funnel – the ship's smokestack, and usually where the company's logo appears. Gangway - Walkway between the ship and the shore while the ship is docked so that passengers may embark and disembark. Godmother – traditionally she blesses a new ship as it begins its inaugural voyage. Royalty, well known celebrities and even a cartoon character have been honored as godmothers of ships. See also Naming Ceremony. Knot – how the ship's speed is measured. One knot equals one nautical mile per hour. Length - the distance measured from the very front of the ship to the very back of the ship. Maiden Call – the very first time a ship calls in a particular port of call. Maiden Voyage or Inaugural Voyage – the very first sailing of a brand new ship. Midship – the middle of a ship. Naming Ceremony or Launch - the tradition of christening or naming a ship as it begins its inaugural voyage. Nautical Mile - 6,080.2 feet or slightly more than 1.15 land miles. Passenger Space Ratio – the number of gross registered tons (GRT) divided by the total passenger capacity. Passenger to Crew Ratio – The total number of passengers divided by the total number of crew members. Port Side - the left side of the ship when facing forward. Promenade Deck – an open deck that encircles a ship, typically referred to as the walking or jogging track. Registry – the country where the ship is registered. Sister Ships – ships built of the same design. Starboard Side – the right side of the ship when facing forward. Tender – a small boat used to transport passengers from the ship to the shore when the harbor is not deep enough for the ship to dock. 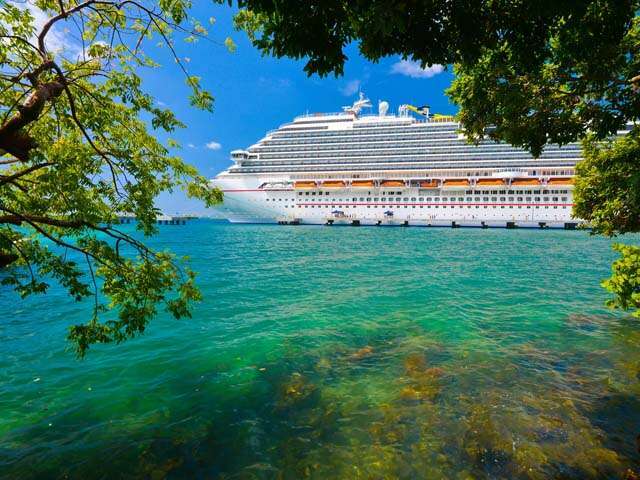 Port of Call – a destination on your itinerary where the ship docks or anchors so that you may disembark and explore. Shore Excursion – an escorted or unescorted tour sold onboard a cruise ship in the various ports of calls visited. Embarkation – Sailing day! Passengers board the ship for their cruise vacation. Disembarkation – the exiting of the ship to either explore a port of call or to end the sailing.